Shortleaf pine is vital to the plants and wildlife of the southeastern U.S. With the help of willing woodland owners like you, we can promote the many benefits of this amazing tree species. Alright...but what is a shortleaf pine forest? In the early 1900s, shortleaf pine forests were everywhere in the eastern U.S. In pure stands or in mixed shortleaf pine/oak savanna ecosystems, they grew on more than 280 million acres from southeastern New York to northern Florida, and west to eastern Texas. Shortleaf pines were so common that they supplied the nation with more than one-fifth of its southern yellow pine lumber. The secret of the shortleaf’s success was its adaptability. It grows well in a variety of soils, including thin, rocky and nutrient-poor soils, and tolerates a wider range of temperatures and moisture levels than other southern pines. It also tolerates fire—its seedlings have a sharp bend in their stems that keep the root collar below the forest’s litter layer and safe from damaging heat during a fire. This enables the seedlings to resprout from the root collar and keep growing, even if the seedling is burned. But despite its ability to adapt and survive, the shortleaf’s dominance turned into a decline that has drastically reduced its range—and continues to threaten it today. 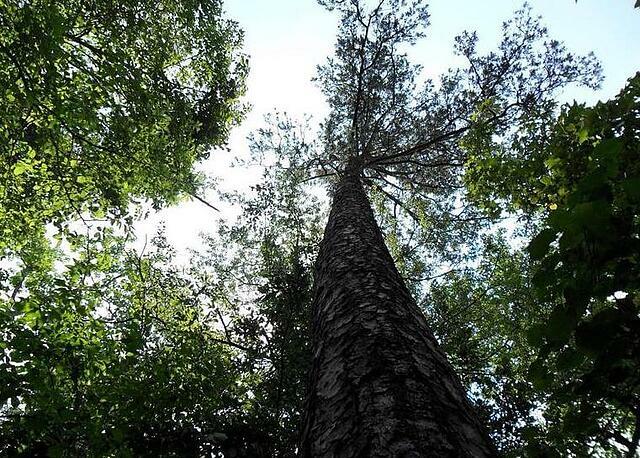 You can help stem the decline of shortleaf pine. Some studies suggest that shortleaf pines in mixed stands are healthier, because the hardwoods prevent soil moisture loss and buffer the pines from disease and pests. Mixed stands also provide richer, more diverse habitat. Creating this kind of forest from scratch does take more intensive management at the start, however. 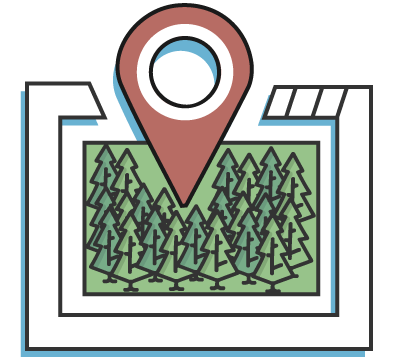 Picking your site: Because shortleaf pines are adaptable and shade-intolerant, they tend to do well in clearcut or disturbed areas, such as eroded lands or old mine sites. They grow best in deep, well-drained soils. Avoid poorly drained soils or soils with a high calcium content or high pH, as these can limit shortleaf growth and make the tree more susceptible to disease. Preparing your site: At the seedling stage, shortleaf pines don’t tolerate shade or competition from other woody vegetation. To give the seedlings their best chance at growth and survival, remove any competing vegetation with herbicide application or prescribed fire before planting and as seedlings become established. This is true whether you’re creating a pure or mixed stand; if your goal is a pure stand, longer-term and more intensive control of competing hardwoods will be needed. Bareroot seedlings are exactly what they sound like—seedlings with minimal soil attached to their roots. Their roots are exposed and easily damaged this way, so bareroot seedlings are often more stressed and have a lower survival rate. Your viable storage time and planting window will be shorter if you opt for bareroot seedlings. However, they are less expensive and easier to handle in bulk. Containerized seedlings are grown and sold in individual containers that hold the soil mass and roots together. This keeps the roots intact and undisturbed until planting and reduces stress on the seedlings, so they tend to survive better and store for longer. They do cost more, however. Whether you choose bareroot or containerized seedlings, handle them with care before planting for best results. Keep the roots moist, and protect the seedlings from wind and heat before planting. Store them in a cool, well-ventilated area, and plant them as soon as you can. Planting your trees: Shortleaf pines are sensitive to rough handling and poor planting, so handle them carefully and hire an experienced planting crew if you can. Shortleaf pines can be planted between October and March, but planting in late February through early March is recommended for high survival. Remember: shortleaf pines like their space. 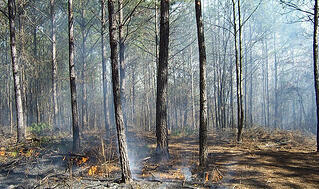 It’s best to plant them relatively sparsely, at about 300 to 360 shortleaf pine seedlings per acre. Caring for your pines: Shortleaf pines grow slowly during the first 2-3 years after planting, and remain sensitive to competition and shade throughout their lives. You will need to control competing vegetation as they become established. A WoodsCamp report will identify if your land has the conditions needed to restore shortleaf pine. If there is an opportunity to grow shortleaf we can also connect you will local professionals and resources to help you get work done as part of this important restoration effort. Need a WoodsCamp report for your land? Original blog content from the American Forest Foundation. Republished with permission.